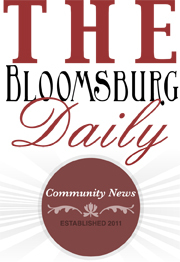 Celebrating the unique connection between the Bloomsburg Theatre Ensemble’s commitment of bringing live, professional theatre to our region and the Town of Bloomsburg, TreeFest once again heralds the beginning of the local holiday season. 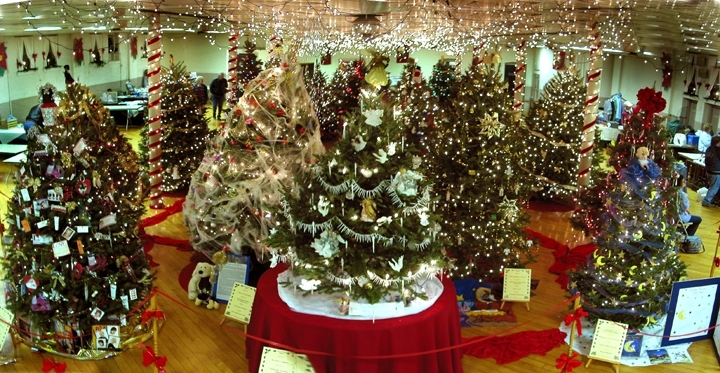 This year, TreeFest will be held November 25, 26 and 27, and December 2, 3 and 4 at the Caldwell Consistory, located north of the town fountain at 150 Market Street. 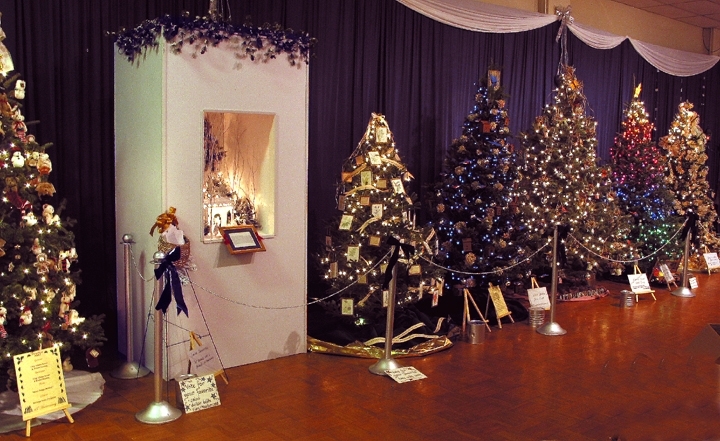 The celebration begins with the area’s growers donating over 140 trees, then hundreds of people including community volunteers, youth groups, florists and garden clubs set up and decorate the rooms and trees which are each sponsored by area businesses or individuals. TreeFest ends with the trees, decorations and other gifts going to area families in need, as identified by local social service agencies. Throughout the event, a variety of entertainment is provided including school choirs, dance groups and folk musicians performing in front of a seasonal mural. Story times and art experiences for children are scheduled throughout both weekends. Visitors will be able to start their Christmas shopping at the dozens of professional craft artisans displaying their wares for sale. But TreeFest has grown into so much more. A special Chinese auction, a children’s coloring contest and the raffling of a spectacular quilt are some of the other highlights. 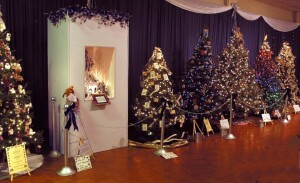 The gala Chamber After Hours is set for Nov. 29 beginning at 4.30, and the Rotary Christmas party takes place Dec. 1. TeaFest, an elegant Scottish high tea, will be presented by Sharon Duff at the Caldwell Consistory on Monday, Nov. 28 at 1:00 p.m.
TreeFest counts on hundreds of volunteers over the two-week period, and children continue to be actively involved. Local schools participate in a Gingerbread house building contest, guides take young children on special tours, and students from Bloomsburg, Central Columbia and Bloomsburg University help in a variety of ways but most especially as part of tear down, clean up and tree distribution which mark the end of TreeFest activities. Official parking behind the Columbia County Court House will be available on weekends. Bring your $2.00 discount admission coupon and visit www.treefest.org for specific hours. Bloomsburg Theatre Ensemble is celebrating 34 years of bringing live, professional theatre to the Bloomsburg and regional community. All TreeFest proceeds benefit BTE. Remember when Bloomsburg had a Drive-In Theater? How about when there were movie theaters on Main Street? Did you know that not only was there the Capitol and Columbia, but at one time there was also a Nickleodeon on the west end of Main Street? This week we share our memories of being At The Movies. My earliest movie memories are all tied to the Capitol. Remember when it was all one theater with a balcony instead of two screens? The ceiling had the most beautiful and intricate medallion on it — probably a leftover base from a chandelier that was before my time. I always got to the theater early so I could get my favorite seat (the middle of that center row, the row that had no one in front of it so short people like me could never get stuck sitting behind a tall person). I must have spent hours over the years, staring up at that medallion, listening to that tape they played before the movie started. Do you remember it? “I’ve been to Paradise (But I’ve never been to me),” and “The Age of Aquarius” were on there. 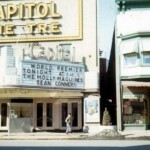 Does anyone remember any of the other songs they used to play before the movies at the Capitol? And remember that side exit they would open when the movie was over? Remember the mask that hung in the alleyway? The first movie I ever saw was Star Wars at the Capitol. I was only five years old so I fell asleep before the Death Star blew up. But I went back to see it many many times after that and was so in love with movies because of it, I knew I wanted to work on them when I grew up. And now I do! What was the first movie you saw in town? Which theater was it in? 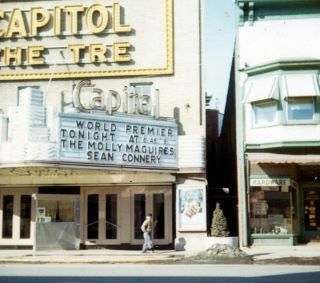 And does anybody remember when the Capitol showed “The Molly Maguires” (see this column’s photo)? I only have one memory of the Columbia Theater. By the time I was a movie-goer, that theater had fallen into quite a state of disrepair but they showed “Raiders of the Lost Ark” so I had to go there! About…14 times! “There was a movie I wanted to see at the Capitol, ‘Green Mansions’ I think it was. It was a beautiful summer afternoon so I emptied my piggy bank, and with my life’s savings in my pocket I walked out to Old Berwick Road and waited for the next North Branch to come by. I got off at the corner of East and Main and headed towards the Capitol theater, window shopping along the way. About three doors from the theater, there in a store window, were two new hot rod model car kits, “The Green Hornet” and “The Black Widow”. It was a tough decision, but I chose the Green Hornet, $1.49, and counted my money one more time. I had it made! But when she gave me the total, there was this thing called ‘sales tax’! Now I was a nickel short of the 25 cents it took to get into the movie! I needed a loan, so I walked down Main Street to Grammy Edwards’ bake shop. Grammy wasn’t there! She was running an errand and Nola, the lady who worked for her, was taking care of the store. Now what? Nervously, I explained my predicament to Nola and asked if she thought Grammy would mind loaning me a nickel. She laughed and said, “Of course not”, and handed me a dime from the cash register. What are your Bloomsburg movie memories? Add on to the conversation below.